On this episode of Working: Syracuse, we speak with police officer Leonard Brown, who has served on the force since 2011. About 18 months ago, he joined the elite Crime Reduction Team (CRT) within the Syracuse Police Department. With headquarters located on Erie Boulevard East, the CRT is a proactive, 12-man unit that has focused on fighting some of the city's toughest issues since 2005: drugs, guns, and gang violence. Brown, one of just two officers of color in his unit, and his partner, Joel Dorchester, gear up to protect the community five days a week, from 4 p.m. to 2 a.m. Violent crime in Syracuse has been declining — 21 homicides in 2017, the lowest number of violent deaths in five years. But in just one weekend in April, Syracuse saw three gang-related homicides. Brown works to protect the city's neighborhoods that struggle with gang activity, capturing guns and drugs, while combating negative views of the police force. He enjoys the physical nature of his work, which reminds him of what he loved about sports when he was younger. As a teenager, Brown lived for the thrill of scoring touchdowns. Now, he gets his adrenaline rush from putting on a different kind of uniform every day. Officer Leonard Brown walks towards a suspect's vehicle to look for any drugs, guns, or illicit cash. 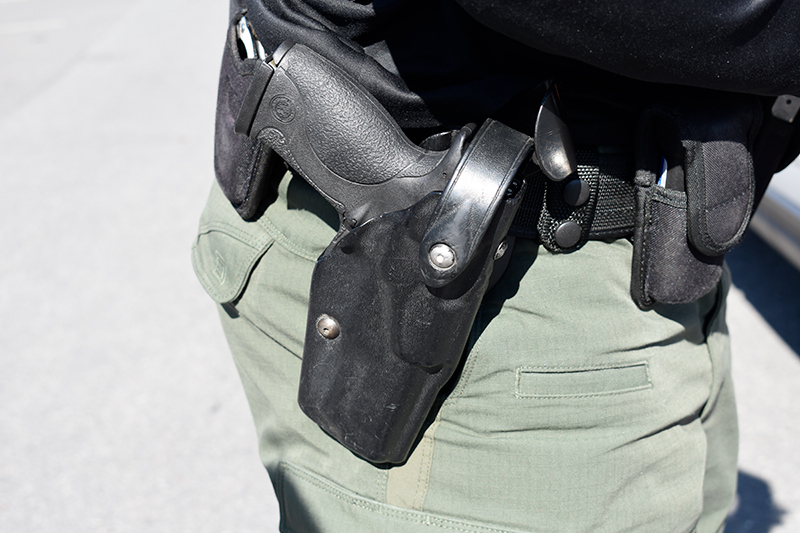 Officer Brown's gun always sits on his duty belt. He's only fired once in his seven years as a police officer. Officer Joel Dorchester (left) and Officer Brown (right) run a man's driver's license through their computer system to check for any outstanding warrants. Officer Dorchester handcuffs a young man before searching his vehicle. Officer Brown issues a ticket for a man with drugs in his possession. BRONTE SCHMIDT, HOST: Hello and welcome to Working: Syracuse, the podcast inspired by journalist Studs Terkel featuring Salt City residents talking about what they do to earn a paycheck and how they find meaning in those jobs. I'm your host Bronte Schmit. On this episode, Yerin Kim and Jessica Gorman takes us on a wild ride around Syracuse's Westside with Leonard Brown, an officer on the Syracuse Police Department's Crime Reduction Team. A seven-year veteran of the police force, Brown has only been on the specialized unit for a little over a year. 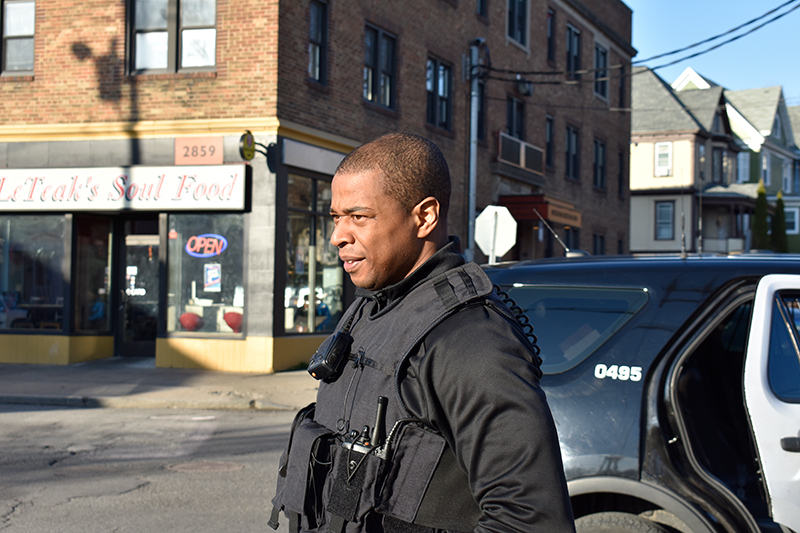 While he's charged with keeping the city safe from major threats like drugs, guns and gang violence, he takes pride in just being a regular citizen of Syracuse. LEONARD BROWN: That guy's a wanted party. LEONARD BROWN: The only thing they see is green pants when we hop out. Yeah hey don't look at the colors, you know? Or they just see you in your blue uniform. YERIN KIM: In parts of Syracuse that struggle, the green pants that Officer Leonard Brown references are an all too familiar sight. 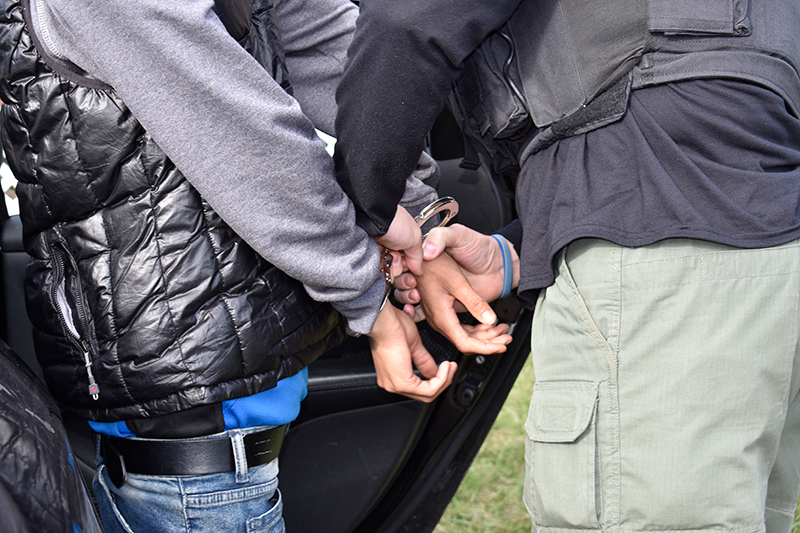 Those involved in the city's criminal underbelly can recognize Brown and the specialized team of 12 officers known as the Crime Reduction Team, or the CRT. LEONARD BROWN: I'm Leonard Brown, currently employed by Syracuse Police Department, currently on their Crime Reduction Team. YERIN KIM: At 6 foot 1, Brown cuts an athletic figure and has a welcoming smirk on his youthful face. He gears up for his shift around 4 p.m. His expression stiffens. He pulls his black bulletproof vest over his dark sweatshirt and slips into the infamous army green pants. A uniform that speaks to a different approach than the standard navy blue getup donned by every other police officer in the force. LEONARD BROWN: Every police department, especially in cities like Syracuse, need a, I think they need a proactive unit who are out there, you know, trying to deter different types of crimes, especially violent crimes. YERIN KIM: He is one of two African American officers in his unit, yet he doesn't feel that he faces challenges regarding his race within the community. LEONARD BROWN: It'll impact the people who you don't know who see you in passing and maybe have their own thoughts about it, but as far as the people who maybe you're going after, I don't think there's an impact 'cause you're just another guy trying to arrest him. YERIN KIM: Brown and the team operate out of a building on Erie Boulevard that looks like a white warehouse, rather than the headquarters of a crime-fighting unit. 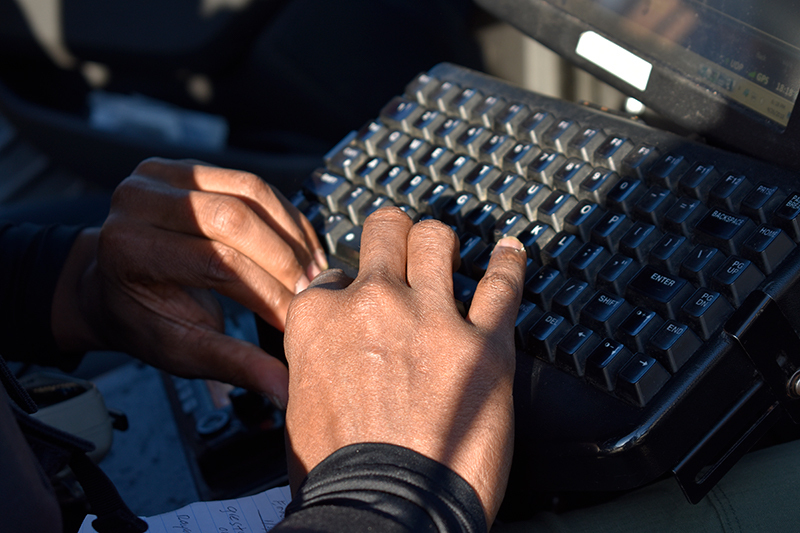 The CRT's unassuming home base contrasts with their hands-on approach to crime fighting. LEONARD BROWN: Uh, when you first came on, everyone wants to do like the type of work we do. You know, so. At least you think you do and then you do it, and you gotta figure out how hard it is. No, but I still like doing it, so. It was one of the few places that I saw myself still going and actually having fun. YERIN KIM: But the fun started long before he entered the force. Growing up, Brown loved sports more than he loved classes. The irony of shunning authority was somewhat lost in the pursuit of chasing a ball. LEONARD BROWN: My group of kids that I was involved with, we were just more into sports. We were probably more into sports than we were into, like school. We probably just went to, tolerated school just so we could still play sports and stuff like that. So I think that helped us out, as far as not getting into trouble. YERIN KIM: Brown was a point guard on his high school basketball team in Clifton, New Jersey, and a running back and cornerback on the football team. Soon after, another brotherhood caught his eye. LEONARD BROWN: You know what? I think growing up, like, as a kid, no matter who you are or where you are, whenever you see a cop car come down your street, like fast with his lights and sirens, you look out... and, and you know just for the glimpse... and like most kids and most people, I just was like, man, it'd be really cool to be the person in the car, driving, instead of watching. So probably just came down to that. YERIN KIM: When searching for a career, he knew he didn't want to work behind a desk his entire life. He craved that same adrenaline rush he felt when he played sports. LEONARD BROWN: It just feels like you hit a really long three-pointer or you just had a really long touchdown run. But you know, I don't try to get caught up into it either 'cause there's always another day, you know? So just enjoy it for the moment. And I even enjoy when other guys on my team get good catches too 'cause you know it all reflects good on Syracuse police as a whole. YERIN KIM: At 4 p.m role call, the CRT meets to discuss any pressing incidents and be informed of the areas they need to target. 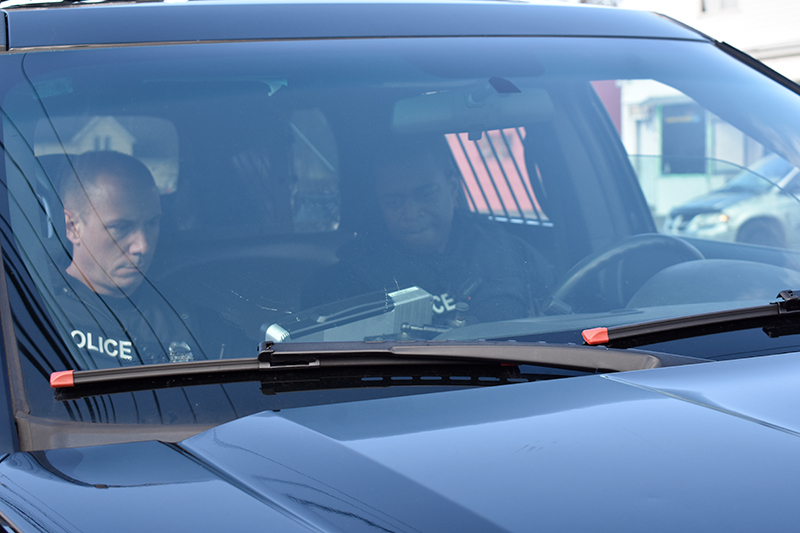 Afterwards, Brown and his partner, Joel Dorchester, get into their marked police car. They've been partners for a little over a year, ever since Brown joined the unit. YERIN KIM: The Syracuse Police Department's intelligence team gathers data from the streets and social media for the CRT to target drug and gun activity in the most dangerous neighborhoods. Gangs plague the west side of Syracuse, and as Dorchester explains, it is a specific point of interest for the CRT. JOEL DORCHESTER: We do have national gangs here like Bloods and Latin Kings, and stuff but it's not as prevalent as our local gangs. Brighton Brigade, Elk Block, Uptown. We go just to the certain gang territories and we just concentrate our whole unit in one territory at the same time that way we flood the whole area, and if something happens we have like, all of us there. YERIN KIM: Through the first ten months of 2017, the CRT seized more than one hundred guns, twelve hundred grams of cocaine, almost seventeen thousand grams of marijuana, and one took hundred and seventy thousand dollars of illicit cash off the streets. Whenever Brown patrols, he is always seeing familiar faces, for all the wrong reasons. YERIN KIM: As a police officer, Brown considers himself a good judge of character. But when it comes to telling whether something is right or wrong, it's not always black or white. LEONARD BROWN: I mean, if I got no reason to stop and talk to them, if he's just walking down the street, listening to his music, you know what I'm saying? Then I got no reason to talk to him. Then you gotta keep driving, but if they've got a warrant, committed a traffic violation or something, you know? We can say hi to everyone, they just don't have to talk to us. YERIN KIM: But sometimes, people can be hard to read. Which is why when he had to use his gun for the first time, he was caught completely off-guard. LEONARD BROWN: I don't know if it was like an "oh man, I'm gonna die" feeling, it was just like a "holy crap, that's a big gun" when he got out of the car. 'Cause it was a, it was a .357, I believe. That's a huge revolver. I remember when he got out of the car, it was huge. And it was nighttime and you could see the silver glistening of the gun as he had it in his hands, from the night lights of the apartment building. YERIN KIM: When his partner saved him from what could have been a bad ending, the moment felt more like a hail mary. LEONARD BROWN: You know, it doesn't feel like a touchdown at first because you're so like, you got all the adrenaline going. You just wanna make sure that like, your partner's OK, that you found the gun and things like that. YERIN KIM: In an age when everyone has a camera, police officers are often portrayed in a negative light. But when officers like Brown do their job right, it's not an issue. It's just their duty, that officers are supposed to protect and uphold. SOUND: [Brown and Dorchester call out to greet kids. LEONARD BROWN: Yeah so I mean go ahead, you can record me all you want. I've let people who've like, I've stopped while I'm stopping, like Facebook Live and stuff because it doesn't matter. Especially if there's no danger and things like that. So you can do whatever you want, I don't care. YERIN KIM: It's clear Brown is often frustrated by the public's scrutiny of police officers. But he emphasizes that police departments are different across the country. He knows that ignoring the critics and simply doing his job is the best solution. LEONARD BROWN: Yeah, yeah, you know. It's just like they just assume we're all cousins or something. Or we're somehow all intertwined. We kind of are in the sense of our mission statements maybe, but no, I don't pay super a lot of attention to that. YERIN KIM: In the end, Brown's proudest moments come from helping people. He recalls a time when one of the bad guys actually thanked the officer shortly after his incarceration. YERIN KIM: Brown's interest in serving his community stems from the fact that once he takes off his uniform at the end of the day, he's just like any other Syracuse resident. LEONARD BROWN: Everyone always thinks we're out to get everyone, like you know, just because the police is behind me, he wants to give me a ticket. Most, most cops really, once they realize that you're just a normal citizen out there paying their bills, doing that, they don't want to mess with you. Especially not the guys in this unit, you know? So we're not out to get everybody. BRONTE SCHMIDT, HOST: Thanks Yerin. As a cop, Brown prefers to keep the peace. But he has an ironic way of judging how cool people are - whether or not they have seen the movie Lethal Weapon. He said it sets the standard for cop movies. BRONTE SCHMIDT, HOST: That's all for this episode of Working: Syracuse. Check out our website www.workingsyracuse.com for more interviews and extra content about Brown. Be sure to follow us on Facebook and Twitter @WorkingSyracuse. This episode was written by Yerin Kim and Jessica Gorman, and produced by Jared Bomba. Our theme music is by Logan Piercy. I've been Bronte Schmit, and it's time for us to clock out.